Just 16 more days until that big day...here's an idea on how to spend that Barnes and Noble giftcard you get from the grandparents. Simon Kent is just another ordinary boy: he lives in an orphanage, is bullied on, and loves playing video games. His life might be a little rough, but he's a tough kid. But after a visit from an intriguing girl from another world, Simon's life is ordinary no more as he's forced to cope with a whole slew of strange and mysterious magical things, including learning of his own perplexing powers, and becoming the one hope of an odd society. 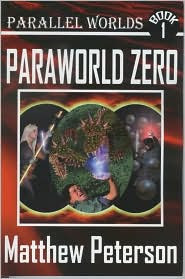 Enticing and very entertaining, Matthew Peterson creates in Paraworld Zero a very engaging and attention grabbing first novel that both me and my younger brother enjoyed, and had us fighting over who's turn it was to read the book. We'll be eagerly looking forward to the next in this funny, unique, and imaginative series. Author Matthew Peterson will be a guest blogger sometime later this week, so leave your questions/comments in either a comment or email me (thecompulsivereader@gmail.com) with them. Stay tuned to see what he has to say! This book will be available in January 1, 2008. And thanks for the blog comment. TRT is a website. Teensreadtoo.com. I just started reviewing for them.